Up for review today is the Davidoff Year of the Rooster. Anyone who knows me knows that I hold Davidoff in high regard. Yes, their cigars are at the upper end of the price spectrum (at least for non-Cubans). 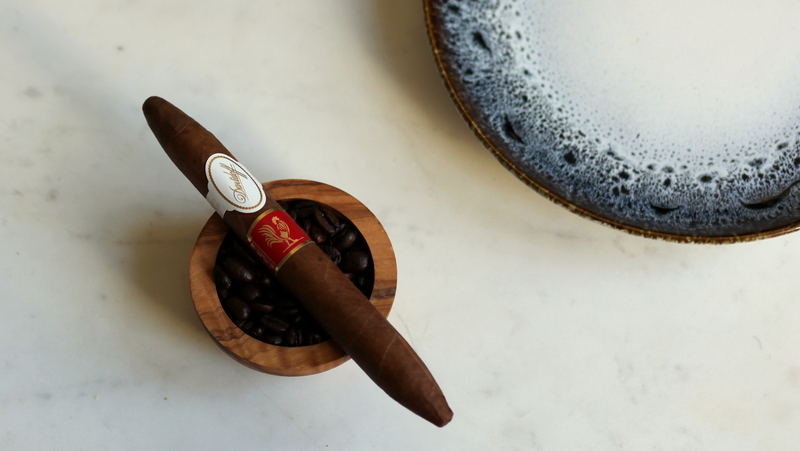 But the quality, consistency, complexity, and harmony of most Davidoff cigars give the company a well deserved status as a legendary cigar company. 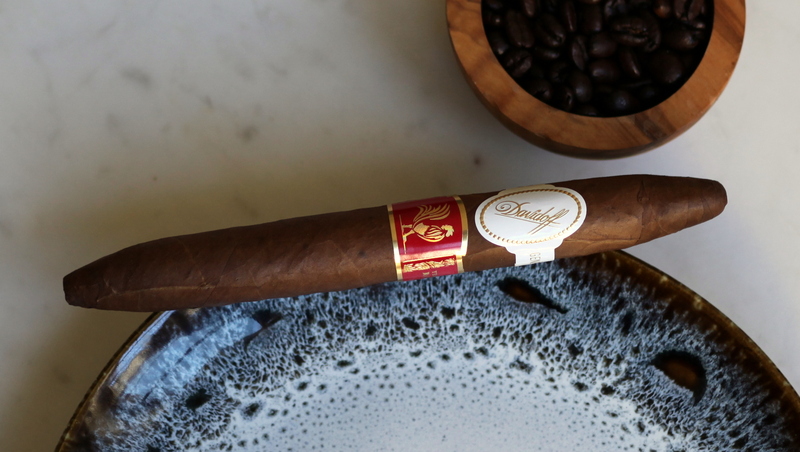 The Davidoff Year of the Rooster is a limited edition cigar that was released in late 2016. The cigar is rolled in a classic size (a 6 3/4 x 50 diademas finas). Production for this cigar was limited to 8,000 boxes of 10 (80,000 total) at a price of $40 per cigar. Let’s get to the review and find out if this cigar justifies the higher price point. The Year of the Rooster is an attractive cigar, with a double band (one white and gold, the secondary band red and gold). The Ecuadorian Habano wrapper is chocolate brown, mostly smooth with some visible seams. The cigar is moderately firm when squeezed, but by no means hard. As I test the firmness across the length of the cigar, it is mostly consistent, with a one soft spot near halfway. After cutting using a straight cut, I test the draw which turns out to be about a 7/10 in terms of restrictiveness. My guess is this will change as I smoke the cigar and the foot widens over the course of the smoke. The pre light draw reveals some wood notes, touches of spice, and a surprising and enjoyable plum note. The Davidoff Year of the Rooster opens with mild but robust smoke. The the smoke is cool and slightly creamy, with flavors of coffee, salted almonds, and a touch of caramel. The finish is clean. The draw doesn’t restrict the smoke production, which is at or above average. At about an inch and a half in, the burn is razor sharp. A subtle pepper note has developed alongside a dry cedar note. There are touches of sweetness here and there, but by and large the saltiness is carrying the flavor profile. By halfway, the body has increased to medium. The pepper has morphed into a spiciness, and an additional oak and floral note has entered the mix. Construction is still perfect, and as expected at this point, the draw has improved to about an average amount of restrictiveness. In the final third, the body picks up to medium full, with notes of dry oak, almonds, roast espresso, grass, and white pepper on the palate and the retrohale. Dominant still however, is the saltiness, which I wish would take a backseat to the faint cinnamon flavor that’s been trying to edge into the profile throughout the smoke. This third doesn’t express the amount or kind of complexity I was hoping for in the home stretch. At two inches to close, the smoke heats up considerably and I put the cigar down. I can’t help but feel a bit disappointed by this offering from Davidoff. While the cigar initially offered an interesting, albeit mild, bouquet of flavors, the second half was dominated by saltiness and dry wood that effectively elbowed the more enjoyable elements out of the experience. For this Davidoff cigar, and at its $40 price point, I’d have to recommend a hard pass.